"We often hear inspiring stories from our millions of users around the world, and this is a way to bring to light those stories and the everyday heroes involved in them," said Ken McDonald, vice president of customer acquisition, TeamSnap. "It's easy to get swept up in the competitive spirit of sports, but when it comes down to it, we're all out there on the field to have fun and support each other. We're excited to see what submissions people send." BOULDER, Colo., May 28, 2014 (SEND2PRESS NEWSWIRE) — TeamSnap and Sports Feel Good Stories today launched a contest to find the “Sports Feel Good Story of the Year” to recognize inspiring athletes, coaches and fans from around the world. Submissions will be accepted between now and October, and winners will be chosen in December 2014. Whether spectators or participants in the stories, people can submit entries through Oct. 31 at SportsFeelGoodStories.com. 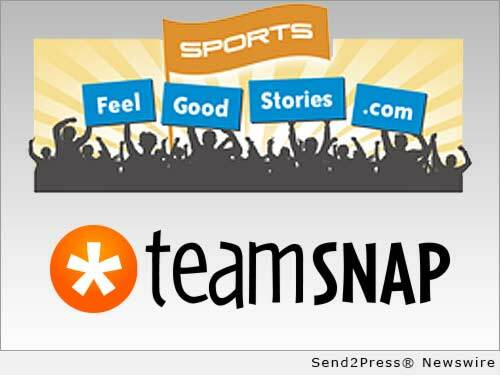 A panel of representatives from TeamSnap and Sports FeelGood Stories will select 10 finalists at the beginning of November, followed by a public vote on the site to determine the first, second and third place stories. The first place winner will receive a $500 cash prize. See complete details at http://SportsFeelGoodStories.com/. Nearly 7 million users around the world use TeamSnap to coordinate sports and other ongoing activities. For more information, please visit http://www.TeamSnap.com/. SportsFeelGoodStories.com showcases inspirational sports stories that focus on good deeds, overcoming obstacles, achievement and sportsmanship. Original Keywords: TeamSnap and Sports Feel Good Stories,Sports Feel Good Story of the Year TeamSnap Boulder Colorado BOULDER, Colo.
REFERENCES: Boulder Business News, TeamSnap and Sports Feel Good Stories,Sports Feel Good Story of the Year TeamSnap Boulder Colorado BOULDER, Colo.